HEY YUM! 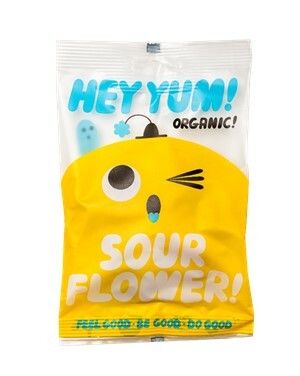 is award winning yummilicious ORGANIC candy, infused with fruit, sweetened with sugar and honey, and mixed with love. 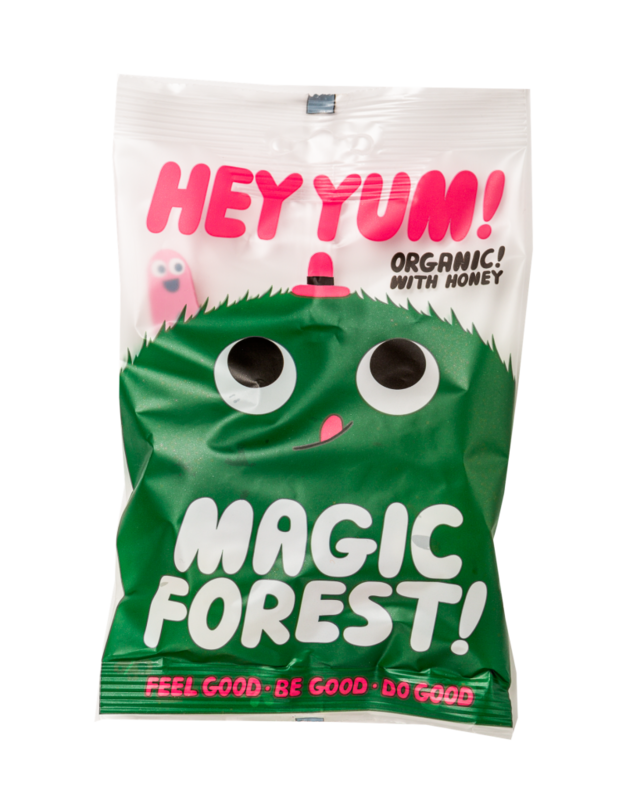 A universe of soft, juicy organic fruit gums with a note of honey in the shapes of elves, butterflies, owls and many more magical creatures. Glucose syrup*, sugar*, honey* (5%), gelatine*, acid: citric acid; fruit juice concentrates* (1,1%) from: apples*, elder*, black currant*, lemon*, and raspberries*; natural flavourings, curcuma extract*, rapseed oil*, algae extract (spirulina platensis*), canauba wax*. Sugar* (37%), glucose syrup*, gelatine*, starch*, acid: citric acid, malic acid; elderberry juice concentrate*, natural flavourings, curcuma extract*, caramel syrup*, algae extract (spirulina platensis*). 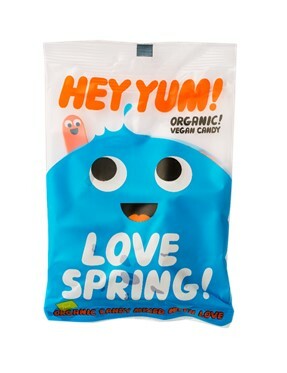 Soft, vegan fruit gummies infused with delicious red berries and formed from a love theme with hearts, fish and water drops. Glucose syrup*, sugar*, gelling agent (pectin), acid (citric acid), acidity regulators (sodium tartrates, potassium tartrates), natural flavorings, natural orange flavoring with other natural flavorings, natural cowberry flavoring with other natural flavorings, fruit juice concentrates* (black currant*, raspberry*, orange*, cowberry, strawberry*, black carrot*), natural turmeric flavoring*, carnauba wax*. All HEY YUM! sweets are certified ORGANIC. It’s something we’re passionate about. We believe ORGANIC is best for the planet and best for people. Including people with a sweet tooth. All our sweets carry the EU organic logo. 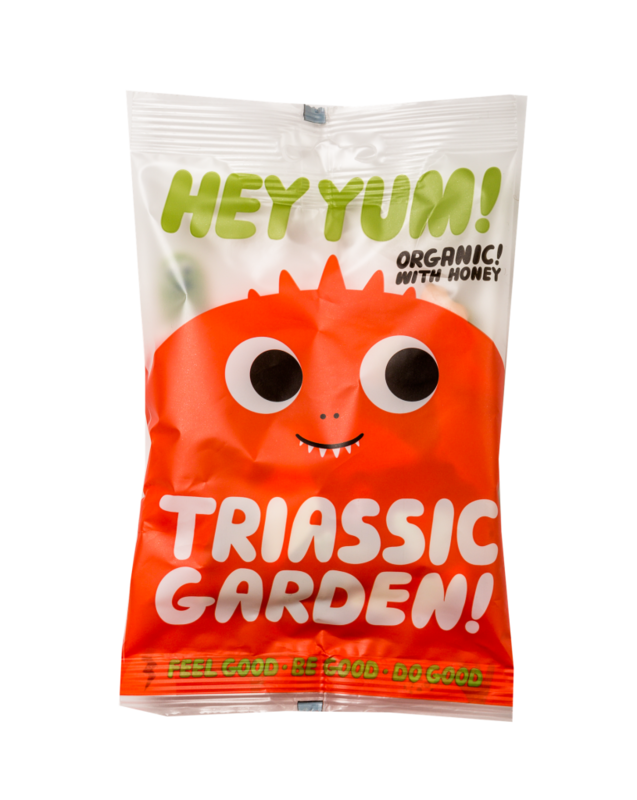 They are made from all natural and organic ingredients and without any artificial flavour or colour. All basic ingredients come from controlled organic farms.